About 13.8 billion years ago the Universe started with a bang, kicked the doors in, brought fancy cheeses and a bag of ice, spiked the punch bowl and invited the new neighbors over for all-nighter to encompass all all-nighters from that point forward. 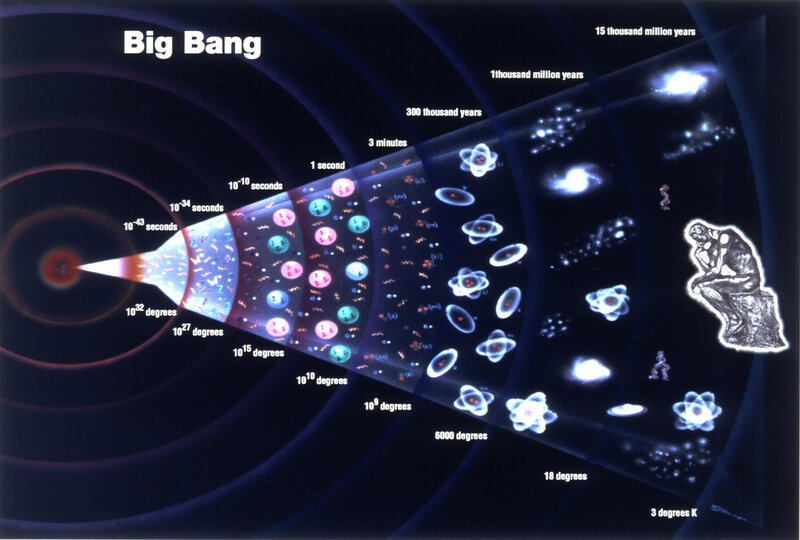 What was going on before the Big Bang? Usually, we tell the story of the Universe by starting at the Big Bang and then talking about what happened after. Similarly and completely opposite to how astronomers view the Universe… by standing in the present and looking backwards. From here, the furthest we can look back is to the cosmic microwave background, which is about 380,000 years after the big bang. Before that we couldn’t hope to see a thing, the Universe was just too hot and dense to be transparent. Like pea soup. Soup made of delicious face burning high energy everything. In traditional stupid earth-bound no-Tardis life unsatisfactory fashion, we can’t actually observe the origin of the Universe from our place in time and space. Damn you… place in time and space. Fortunately, the thinky types have come up with some ideas, and they’re all one part crazy, one part mind bendy, and 100% bananas. The first idea is that it all began as a kind of quantum fluctuation that inflated to our present universe. Something very, very subtle expanding over time resulting in, as an accidental byproduct, our existence. The alternate idea is that our universe began within a black hole of an older universe. I’m gonna let you think about that one. Just let your brain simmer there. There was universe “here”, that isn’t our universe, then that universe became a black hole… and from that black hole formed us and EVERYTHING around us. Literally, everything around us. In every direction we look, and even the stuff we just assume to be out there. Here’s another one. We see particles popping into existence here in our Universe. What if, after an immense amount of time, a whole Universe’s worth of particles all popped into existence at the same time. Seriously… an immense amount of time, with lots and lots of “almost” universes that didn’t make the cut. 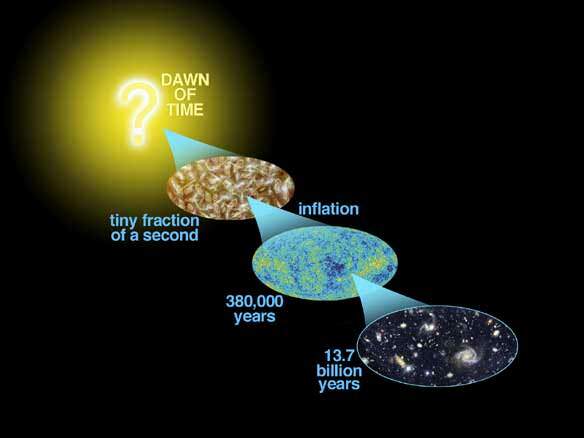 More recently, the BICEP2 team observed what may be evidence of inflation in the early Universe. Like any claim of this gravity, the result is hotly debated. If the idea of inflation is correct, it is possible that our universe is part of a much larger multiverse. And the most popular form would produce a kind of eternal inflation, where universes are springing up all the time. Ours would just happen to be one of them. It is also possible that asking what came before the big bang is much like asking what is north of the North Pole. What looks like a beginning in need of a cause may just be due to our own perspective. We like to think of effects always having a cause, but the Universe might be an exception. The Universe might simply be. Because. You tell us. What was going on before the party started? Let us know in the comments below. Time is an illusion caused by the passage of history (Douglas Adams 1952-2001). The way that we deal with time is central to a major current schism in physics. Under classic Newtonian physics and also quantum mechanics – time is absolute, a universal metronome allowing you determine whether events occur simultaneously or in sequence. Under Einstein’s physics, time is not absolute – simultaneity and sequence depend on who’s looking. For Einstein, the speed of light (in a vacuum) is constant and time changes in whatever way is required to keep the speed of light constant from all frames of reference. 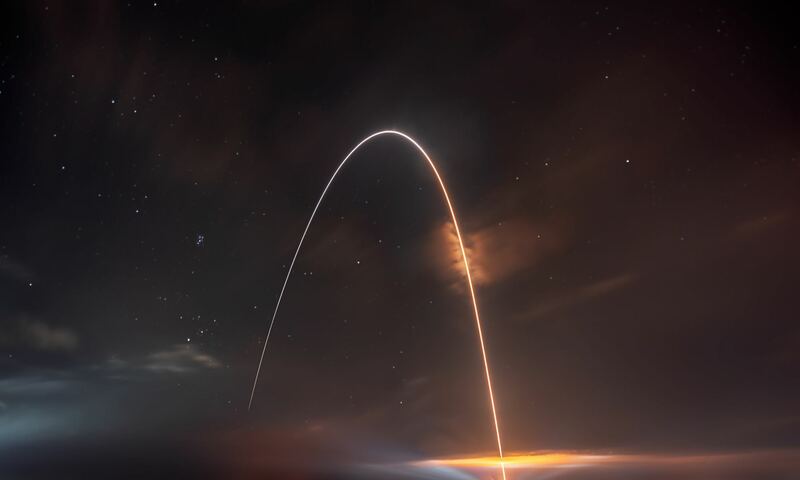 Quantum mechanics does (well, sometimes) require absolute time – most obviously in regards to quantum entanglement where determining the spin of one particle, determines the spin of its entangled partner instantaneously and simultaneously. Leaving aside the baffling conundrums imposed by this instantaneous action over a distance – the simultaneous nature of the event implies the existence of absolute time. In one attempt to reconcile GR and quantum mechanics, time disappears altogether – from the Wheeler-DeWitt equation for quantum gravity – not that many regard this as a 100% successful attempt to reconcile GR and quantum mechanics. Nonetheless, this line of thinking highlights the ‘problem of time’ when trying to develop a Theory of Everything. The ‘time isn’t real’ camp runs the line that time is just a by-product of what the universe does (anything from the Earth rotating to the transition of a Cesium atom – i.e. the things that we calibrate our clocks to). How a return to equilibrium after a random downward fluctuation in entropy might appear. First there was light, then a whole bunch of stuff happened and then it started getting cold and dark and empty. Time is the fire in which we burn (Soran, Star Trek bad guy, circa 24th century). ‘Time isn’t real’ proponents also refer to Boltzmann’s attempt to trivialise the arrow of time by proposing that we just live in a local pocket of the universe where there has been a random downward fluctuation of entropy – so that the perceived forward arrow of time is just a result of the universe returning to equilibrium – being a state of higher entropy where it’s very cold and most of the transient matter that we live our lives upon has evaporated. It is conceivable that another different type of fluctuation somewhere else might just as easily result in the arrow pointing the other way. Nearly everyone agrees that time probably doesn’t exist outside our Big Bang universe and the people who just want to get on and cook dinner suggest we might concede that space-time could be an emergent property of quantum mechanics. With that settled, we just need to rejig the math – over coffee maybe. I was prompted to write this after reading a Scientific American June 2010 article, Time Is An Illusion by Craig Callender.